Uzbek National Cuisine - Main Courses! 1 kg (2 1/4 lb) rice, 500g mutton or beef, 1 kg (36 oz) carrots, 4 onions, 350g vegetable oil, salt, cumin, and cayenne pepper to taste. Heat oil until white smoke appears. Add sliced onions and sear in oil until reddish-brown. Cut meat in pieces and saute with onions. After a few minutes put in carrot strips and cook until golden. Add water, salt, spices and stew for 20-25 minutes. Add rice and more water, just 1-1.5 cm above surface of rice. Cook uncovered until water evaporates. Cover and cook on low heat 20-25 minutes. 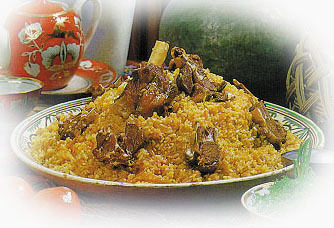 1kg (2 1/4 lb) rice, 300 g mutton or beef, 2-3 quinces, 1 kg (36 oz) carrots, 4 onions, 350g vegetable oil, salt to taste. Prepare in the same manner as Ferhana Pilaff. Before adding rice, add slices of quince. When pilaff is finished, mix rice and serve in a mound on a large platter topped with quince pieces. 1 kg (2 1/4 lb) rice, 300g mutton or beef, garlics, 800g (28 oz) carrots, 3-4 onions, 350g vegetable oil, salt and spice to taste. Wash rice and soak in warm saltwater for 1 1/2-2 hours. Cut meat in small pieces and sear in hot oil. Add sliced onions, after a few minutes put in carrot strip and salt. Add 1:1 water, spices and unpeeled garlic cloves. Stew on low heat for 20-25 minutes. Add rice and cook uncovered until water evaporates. When ready, remove garlic, mix rice and serve in a mound on a large platter. Peel garlic and arrange on top. 1 kg (2 1/4 lb) rice, 150g (5-6 oz) raisins, 800g (28 oz) carrots, 3-4 onions, 350g vegetable oil, salt and spices to taste. In a cauldron, sear sliced onions in very hot oil until reddish-brown. Then add carrot strips and cook until golden. Stir in water, salt and water, then add to cauldron. Add rice and more water, just 1-1.5 cm above the surface of rice. Cook uncovered until water evaporates. Cover and cook on low heat 20-25 minutes or until done. 1 kg (2 1/4 lb) rice, 400g (14 oz) mutton or beef, 800g (28 oz) carrots, 400g (14 oz) onions, 300g or 1 1/4 cup vegetable oil, salt and spices to taste. Wash rice and place in cauldron with salty water and bring to a boil. When completely cooked, drain the rice. Separately boil whole peeled carrots with the meat. Cut meat in pieces and the carrots in thin strips. Mix together, add a bit of salt, ground red or black pepper. Sear slice onions in very hot oil. When reddish-brown, remove and combine with meat and carrots. Put a servings of rice in kosas, coat with hot fat and top with mix of meat, carrots and onions. 1 kg (2 1/4 lb) rice, 1 kg mutton or beef, 800 g (28 oz) carrots, 300 g (11 oz) onions, 300 g or 1 1/4 cup vegetable oil, salt and spices to taste. Cut meat in pieces, marinate, and mix with sliced onions, salt, black pepper, and cumin. Heat oil until white smoke appears. Add meat and sliced onions and sear in oil. Then add carrot strips and water and stew until carrots become tender. Add rice and more water. When rice kernels swell, cover and cook on low heat another 15-20 minutes. Serve on large platter or on individual plates. 1 kg (2 1/4 lb) rice, 500 g (18 oz) mutton or beef, 800 g carrots, 3 onions, 350 g or 1 cup vegetable oil, 85-90 grape leaves, salt and spices to taste. Divide meat into two parts - the base and the filling. Put the other half of the meat through a meat-grinder and combine well with sliced onions and spices. Rinse off the young grape leaves in cold water and place flattened on the work surface. Put a small amount of the meat filling in each leaf and secure roll with thread. Boil the dolmas in a separate pot. Prepare pilaff as per Kovurma Palov recipe above. Add dolmas to the pilaff after pouring water on sauteed meat and carrots. When ready, mix rice and serve in a mound on a large platter topped with dolmas. 1 kg (2 1/4 lb) rice, 500 g (18 oz) mutton or beef, 120 g (4-5 oz) chickpeas, 800 g carrots, 3 onions, 300 g or 1 1/4 cup vegetable oil, salt and spices to taste. Wash rice and soak in salty water 1 1/2-2 hours. Soak chickpeas 5-6 hours or use canned chickpeas. Sear meat and sliced onions in oil until reddish-brown. Add carrot strips and mix thoroughly. Add 1:1 water, chickpeas, salt, and spices and stew for 20-25 minutes. Add rice and cook on low heat 30 minutes. 1 kg (2 1/4 lb) rice, 1 whole chicken, 800 g carrots, 4 onions, 300 g or 1/4 cup vegetable oil, salt and spices to taste. Wash a prepared chicken and chop into portions. Add sliced onions to cauldron and sear in hot oil. Then add chicken pieces and gry well. Follow remaining Kovurma Palov recipe from above. 600g (21 oz) rice, 400g (14 oz) mutton or beef, 400g carrots, 2 tomatoes, 3 onions, 350g or 1 2/5 cups vegetable oil, pinch of black pepper, salt to taste. Cut meat into small cubes, sear in hot oil. Combine with sliced onions, strips of carrots, and tomatoes. Saute well, then add water, bring to a boil, and season. Put in pre-soaked riceand cook strings often. Whenthe water evaporates cover and cook until done. To serve, sprinkle with choped green onions. 300 g or 3 cups mung beans, 500 g or 2 1/2 cups rice, 200 g mutton or beef, 300 g or 1 1/4 cup vegetable oil, 3 onions, 1 bundle (4 oz) green onions, salt to taste. Cut meat into pieces, place in a soup kettle and sear in hot oil. Add sliced onions and continuing frying until onions are half-cooked. Add water or stock and mung beans and simmer until they open. Then add rice, salt and cook until rice is done, stirring often. Serve in bowls and garnish with fried onions. 1 kg (2 1/4 lb) wheat grain, 600 g (21 oz) mutton or beef, 400 g 1 3/4 cups vegetable oil, salt, cinnamon. Crush wheat with mortar and pestle, rinse in water to separate husks. Sift and soak in hot water 5-6 hours. Cut meat into 50-60 g (2 oz) pieces and sear in hot oil. Add soaked wheat and water. Cook, constantly stirring, on low heat 1 1/2 hours. Add salt. Before serving season with ground black pepper and cinnamon. 500 g (18 oz) boneless mutton or beef, 150 g (5-6 oz) animal fat, 500 g (18 oz) each potatoes, carrots, tomatoes, 100 g (3-4 oz) garlic, 2 bell peppers, 1 bunch or 30 g (1 oz) fresh coriander, salt and spices to taste. On the bottom of a small pot, arrange peeled and cubed potatoes. Then layer with thin strips of carrots, followed by quartered tomatoes, sliced onions, choped garlic, and finally small pieces of meat and fat. Remember to season each layer with a little salt, ground black pepper and cumin. Now place the small pot with ingredients in a larger pot. Pour water in larger pot so that it comes up a little over half way up the sides of the smaller pot. Cover larger pot and steam about 2 hours. Check occasionally to ensure that the water does not completely boil off. 300 g (11 oz) mutton, 50 g (2 oz) onions, 60 g (2 oz) carrots, 100 g (3-4 oz) tomatoes, 200 g (7 oz) potatoes, 60 g bell peppers, 20 g (1 oz) butter, 10 cloves garlic, 20 g or 1 1/2 tablespoons water, 1 bunch or 30 g (1 oz) fresh dill, salt and spices to taste. Cut meat into small pieces, tenderize, and season. Place portion of meat in individual earthenware casseroles, layer with sliced potatoes, carrots, tomatoes, garlic, onions, bell peppers, and chopped greens. Add stock or water and butter and bake covered. 400 g (14 oz) mutton or beef, 1 kg potatoes, 3 onions, 3 carrots, 4 tomatoes, 2 tablespoons tomato paste, 150 g or 5/8 cup vegetable oil, 1/2 bunch or 15 g (1/2 oz) fresh dill, 1/2 bundle (2 oz) green onions, salt and spices to taste. Cut meat into small pieces, sear in hot oil. Add sliced onions and saute until golden-brown. Then add tomatoes and mix well. Remove frem heat and add cubed or sliced potatoes and carrots. Cook another 10-12 minutes, mix in salt, spices, cover with water and bring to a boil. Stew until potatoes are done. Garnish with chopped green onions or fresh coriander. 50 grape leaves, 500g (18 oz) mutton or beef, 500g onions, 50g (2 oz) butter, salt, pepper, and spices to taste. Put the meat through a meat-grinder and combine well with sliced onices, salt, red and black pepper. RInse off the young grape leaves in cold water and place flattened on the work surface. Put a small amount of the meat filling in each leaf and secure roll with thread. Place dolmas, weighted, in tight rows in a large pot, add water, butter, and spices. Cook on low heat 25 minutes. Serve 8-10 dolmas on a plate and puor broth over the top. 1 kg (2 1/4 lb) mutton or beef, 200g (7 oz) rice, 1 head of cabbage, 1 egg, 4 onions, 3 tomatoes, pinch of black pepper and red chili pepper, salt to taste. Put the meat through a meat-grinder and combine well with rice, chopped onions, juice from sliced tomatoes, raw egg. salt and black pepper. Place head of cabbage in large pot with boiling water. Blanch about 5 minutes, remove from pot and arrange individual leave on your work surface. Put a fair amount of the meat filling on each leaf and roll up. Boil bones in soup kettle, adding salt, and a whole dried chili for seasoning. Pour strained broth just covering cabbage rolls, cover and cook about 30 minutes. 1 kg 12 sweet bell peppers, 500g (18 oz) mutton or beef, 100g rice or 1/2 cup rice, 1 egg, 4 onions, 3 tomatoes, salt, black pepper and bay leaf. Put meat through a meat-grinder and combine with pre-soaked rice, beaten egg, finely chopped onions, salt and black pepper. To make stuffed peppers, remove stems and seeds from bell peppers and fill with meat mixture. In a large pot, boil meat bones to make broth, place stuffed bell peppers on top and cook over low heat about 30 minutes. Serve 4-6 peppers on each plate and top with strained broth. 1 kg (2 1/4 lb) boneless mutton or beef, 3 onions, 1 teaspoon salt, wine vinegar, red or black pepper, and coriander to taste. Cut meat into pieces and salt. Mix with remaining ingredients in an enamel or china bowl and marinate several hours. Remove meat only, thread on skewers (the final piece should be fat) and grill over hot coals. Serve with sliced onions. 1 kg boneless mutton, 3 onions, 1 egg, 3-4 tablespoons flour, pinch cayenne pepper, salt to taste. Mince fatty mutton in meat-grinder two times. Mix well with onions, cayenne pepper, and salt. Shape mixture into small links, thread on skewers and dust with flour. Grill over hot coals. Serve with sliced onions and tomato salad. 500 g sheep or beef liver, 300 g mutton fat, 300 g (11 oz) onions, 200 g or 1 1/2 cups flour, pepper and salt to taste. Clean the liver, cut mutton fut into 10-15 g pieces. Salt and dredge in flour. Thread liver on skewers, alternating with pieces of fat, and grill over hot coals. Place liver on a serving dish, top with finely sliced onions, salt and freshly ground pepper. 1 chicken, 3 onions, wine vinegar, salt, coriander seeds, and cumin to taste. Cut the cleaned and boned chicken into 20-25 g pieces. Combine well with chopped onions, vinegar, salt and spices. Cover and set aside in a cool place for 8-10 hours. Thread 4-5 pieces of chicken on skewers and grill over hot coals. Serve sprinkled with sliced onions. 500 g (18 oz) mutton, 300 g (11 oz) onions, 80 g or 1/3 cup water, fresh coriander, dill, cayenne pepper, and salt to taste. Cut mutton into 20-25 g pieces, add salt and pepper. Place in individual serving size earthware pots, alternating layers of meat with chopped onions and greens. Add a bit of water to each pot and cook in oven until ready. Serve with greens.